Me-di-a – the means of communication that reaches large numbers of people. Facebook used to be a way to connect with your friends, a medium to find out what was going on in their lives and informing others of what was happening in yours. Though some of your “friends” thought the world was interested in knowing that they just ordered a half-caf, half-decaf, skinny, no foam, caramel-machiatto latte, at the Starbucks next to your house with their BFF (who wasn’t you). In the beginning Facebook and other social media outlets had an innocence about them … and then something changed! As I scrolled down my Facebook page today, I was struck by how this medium to share with friends has become a diatribe of hate. It seems as though Facebook and other forms of social media have become a place for folks to project their inner dissatisfaction and hatred for themselves out into the world. Yes, all you can project on the outer world is the inner landscape of what’s going on inside of you. That, in and of itself should scare the hell out’ve you and cause you to pause before you post. And yet, social media has given us an extraordinary amount of freedom to say what we want to say, post what we want to post, whether we have the facts or not. It is a medium to voice our freedom and opinions without any sense of responsibility for what we post. I find irony in the fact that we have become a society who screams for freedom and yet revolts at the thought of being help responsible for our actions, especially when someone with opposing views speaks out. While searching for the news of what is happening in my friends lives, I am continuously bombarded by ads for products I searched for 6 months ago because my searches are being tracked. These advertisements sneak into every page I bring up on my screen. Clouding, distracting, and blocking the information I am searching for. Yes, even my paid subscription to the Wall-Street-Journal has become polluted. We all experience the onslaught of pop-up videos that materializes out’ve nowhere, blasting a commercial through your computer speakers as you desperately search for the skip, pause, mute, or ‘x’ to close button that has been hidden for their convenience? That said, here are 10 things you can do to stop destroying yourself from the inside and start taking back your freedom. Stop leveraging social media to voice hatred – it speaks more about your inner landscape than the person you are projecting about. Start taking responsibility for what you feed your mind – garbage in and garbage out. The one thing that constantly trips you up is you and your ego. Ego is defined as your level of self-worth or self-importance. If your self-worth is tied to the number of likes you get on Facebook … you’re screwed! Start taking responsibility for what you are creating in your life. Remember, that like attracts like – hatred attracts more hatred, love attracts more love, forgiveness attracts more forgiveness, what do you attract? Don’t be gullible by believing everything that you read – most stuff is just someone’s opinion – and you know what they say about opinions … everyone has one. The media makes billions of dollars by stirring emotion and creating dissent so that they can run ads for companies that want to stir emotion and get you to buy more stuff – you don’t have to support them. Buying more things only dulls the inner dissatisfaction with yourself for so long. Eventually, you end up where you started before you bought all those thing … by yourself … only now with less money! You cannot control the world or anyone else. You only can control yourself. You take control of yourself and your life when you begin to take control of what you think (See #2). Remember that life is short, your legacy will be told by what others say about you … not what you posted about yourself on Facebook. Oxy means sharp, a moron is defined as a stupid person. 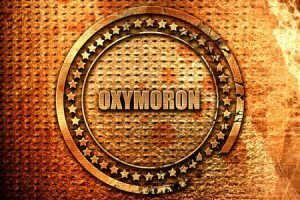 An oxy-moron is literally defined as a sharp, stupid person. See the paradox? You have a choice to be one or the other … I hope we all choose to be sharp, more times than we choose to be stupid.